Photo courtesy of Foremost Cos.
At the heart of 23,000-acre Rancho Mission Viejo, a master planned community (MPC) in Orange County, Calif., is a 172-year-old working cattle ranch—the only remaining one in a county that once teemed with them. The development’s growing neighborhoods, which eventually will sprout 14,000 homes, are rising around a 17,000-acre permanently protected habitat reserve, where cowhands raise the cattle. Inside the community’s gates, homeowners can work alongside farmers tending Orange County’s largest citrus orchard, chicken coops, and three working farms that produce row crops and herbs. 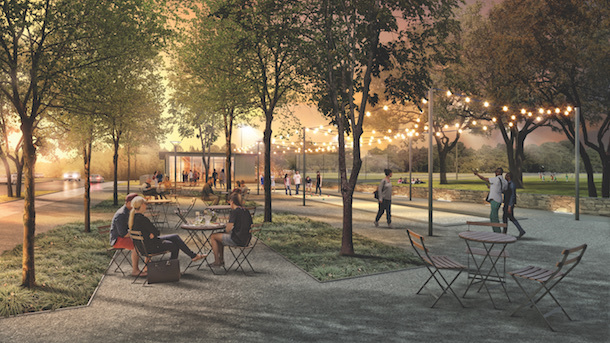 Union Point, an MPC underway outside of Boston, will have many outdoor spaces, including a woodland-style park for informal gatherings, as well as bocce games and other sports (Photo: Sasaki Associates/Design Distill). Much depends on how much land developers can get their hands on. The number of legacy landowners willing to hand their long-held property over to developers is limited, and the inventory of undeveloped land up for grabs by those that can afford to acquire it is thinning out. Especially in Florida, California, and Texas—today’s sweet spots for master plans—a lack of land could force developers to whittle down the size of future communities. “Land is going to tell the story,” says Will Holder, president of Houston-based builder Trendmaker Homes, a division of TRI Pointe Homes. Jody Kahn, SVP of research for John Burns Real Estate Consulting, notes, “We could see some really big ones, still.” But in areas where land is tight, she says, developers may not find enough to allow for mega-communities such as Orange County’s Rancho Mission Viejo and Whisper Valley, in Austin, Texas, which, at buildout, will include 7,500 single- and multifamily homes. “We could be looking at more modest master plans,” she says. Teri Slavik-Tsuyuki, a marketing strategist and one-time chief marketing officer and SVP for San Diego-based master plan developer Newland Communities, notes that Millennial couples are interested in smaller, easier-to-care-for, more affordable homes that leave them the financial freedom to work fewer hours or stoke their sometimes-costly adventurous side. And, as master plans shrink in size, so will the number of amenities they can accommodate. Yet homebuyer demand for homes close to coffee shops, hiking trails, and activities is unlikely to wane, Kahn says, so where developers choose to build their pared-down places could become even more important than what they put inside of them. “Your biggest amenity might be what’s outside your gate: a great location, a great school district, [being] minutes from the beach, nice shopping, major stores,” she says. Greenpoint Landing, a 22-acre master planned development by New York’s Brookfield Properties under construction on the Brooklyn waterfront that will comprise 11 residential towers with 5,500 housing units, public spaces, parks, a public school, and a spate of retailers. 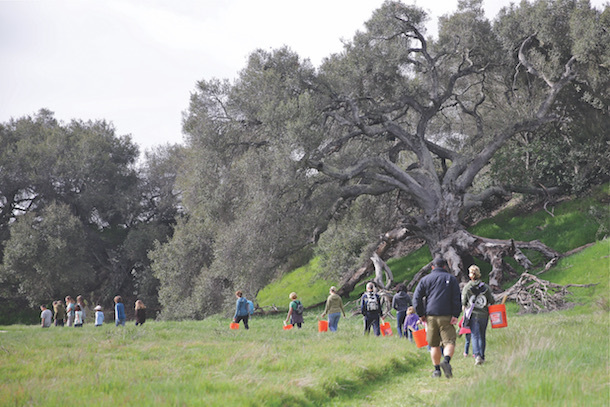 Residents hiking trails at Southern California's Rancho Mission Viejo (Photo courtesy of Rancho Mission Viejo). In the meantime, sales at master planned communities rose 9 percent last year and accounted for 3 percent of all new single-family home sales nationwide, according to John Burns. The consulting firm notes that among the top 50 developments in 2016, master planned communities logged record net sales of 24,374 units, up from 22,447 the year before. Like all MPC developers, the Top 50 are planning for what could be a decade or more of new homes and neighborhoods as they do their best to accommodate the kinds of communities homebuyers want now and predict what they’ll demand three to 10 years out. “There’s no one answer, no cookie-cutter approach,” Slavik-Tsuyuki says. “Except for the principles of good design, there is no recipe.” One thing is certain: The kinds of amenities a community offers—now and in the future—will set it apart from its competitors. The most progressive master planned communities, Slavik-Tsuyuki says, are laser-focused on creating “a sense of place” for their homeowners. Hence, Rancho Mission Viejo’s centerpiece is a cattle ranch. Similarly, Tampa, Fla.-based Metro Development Group is building the first of four planned resort-style Florida communities that feature a 7- to 10-acre crystal-clear lagoon surrounded by sandy beaches. In Denver, The Meadows has a 200-step incline, which residents climb for exercise and to take in views of the town of Castle Rock. But amenities will change, depending on what research reveals about buyers’ lifestyle preferences over the years. Slavik-Tsuyuki foresees communities with incubator spaces and pop-up retail stores where future residents can debut their start-up businesses. “Society has changed and will continue to,” she says. A 2017 Gallup survey estimated that 43 percent of employed Americans spend at least some of their week working from home. With a nod to the Millennial-fueled sharing economy, tomorrow’s MPCs may dabble in co-housing, which features shared spaces such as large kitchens and laundry rooms. 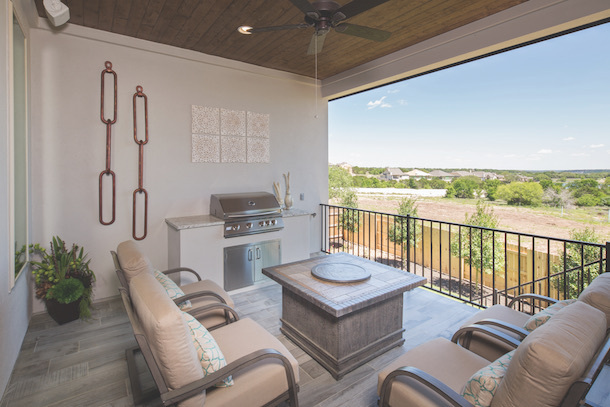 In new MPCs, the homes and the amenities are both important such as this outdoor living space at Trendmaker Homes' Rancho Sienna in Austin (Photo courtesy of Trendmaker Homes). Future developers will focus less on the traditional master plan buyer—the young family—and more on single Millennials and empty-­nester Boomers. Kahn predicts that those groups will live in the same communities, but in homes and neighborhoods different enough to cater to each. Developers are inviting builders of product ranging from affordable rentals to luxury single-family homes to populate rings of neighborhoods in the same planned community. Apartment complexes and 55-plus neighborhoods are close enough that the two groups can share amenities, but far enough apart that 55-plus residents can swim in child-free pools. In between, townhomes or duplexes could sprout up behind apartments; small, single-family homes will occupy the next ring; move-up homes will draw Millennials once they begin their delayed foray into parenthood; and luxury homes or age-restricted enclaves will bring up the rear, according to Martin. “We’re seeing lateral moves already,” he says, of Windsong Ranch, which opened in 2015. Getting the grandparents to move out of the homes where they raised their families, however, requires “a compelling reason,” notes Cameron, whose 961-acre Terramor has reserved 1,000 of its eventual 1,400 homes for 55-plus buyers. Part of it, he says, is the community’s focus on indoor-outdoor living. Kahn notes that most successful master planned communities have created hiking and biking trails and walkways that connect neighborhoods with amenities such as coffee shops, retailers, and offices. Many, like Mission Rancho Viejo, tip a hat to the heritage of their locations. Millennials, Kahn says, care about sustainability and want to live in places that celebrate the environment. To that end, Ayala notes, most master planned communities are foot-friendly. Residents can walk from their homes to the neighborhood’s schools, shops, and restaurants within about 15 minutes.“Our parents’ master planned communities probably required a vehicle to get from one end to the other,” Ayala says. Some communities are reaching even further in their effort to brand themselves as sustainable. All homes in Austin’s Whisper Valley, for example, are Zero Energy Ready, which means they are capable of offsetting all or most of their annual energy consumption. Boston-based developer Taurus Investment Holdings installed an underground geothermal loop field, which all of the homes will use as their source for heating and cooling. Although geothermal can halve the cost of a homeowner’s heating bill, Douglas Gilliland, Texas and Colorado managing director for Taurus, says builders didn’t embrace it at first. “Production builders have a very fixed model that they build their homes to; that’s one of the ways they achieve efficiencies,” the developer explains. 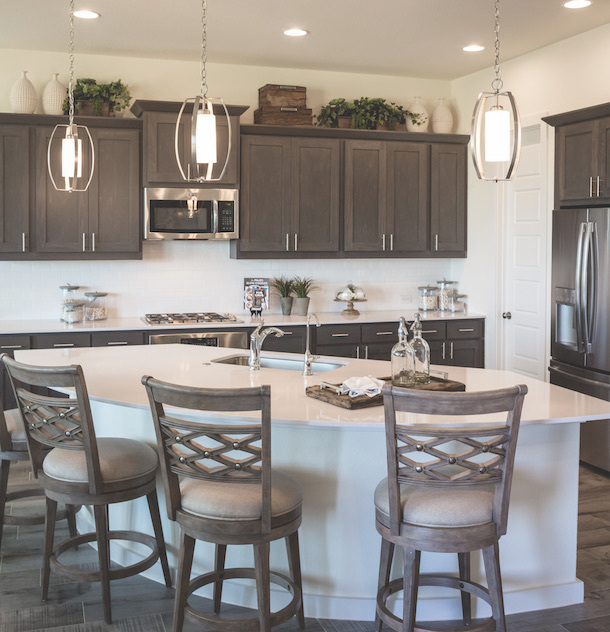 Trendmaker Homes' Rancho Sienna boasts Texas Hill Country charm and draws a range of buyers with its features, such as a kitchen that servce as a prime gathering area (Photo courtesy of Trendmaker Homes). To offer community, connection, services, and infrastructure is essential. Located on the site of a decommissioned Naval Air Station 12 miles from Boston, Union Point is a 1,500-acre master planned development situated where three suburban towns intersect, just a 10-minute walk from commuter rail. The MPC is also designed to adapt to electric driverless shuttles, has garages retrofitted for other uses, and includes flexible, multi­use streets. LStar Ventures, Elkus Manfredi Architects, and Sasaki Associates have collaborated on the town, which offers entertainment, sports, art, culture, and education, as well as open spaces and pedestrian- and bicycle-friendly roadways. Some 4,000 residential units, 1,000 acres of green space, and 50 miles of hiking/biking trails are planned, plus ample commercial development, office space, and retail space, as well as food and beverage options. The creators aim to offer the perks of urban density in a place that meets residents’ needs for convenience and quiet at the same time. Sharon O’Malley is a writer, editor, consultant, and journalism professor based in College Park, Md.